يضمن فندق Shoreline Motel الذي رمم في 2010 لزائريه قضاء وقت ممتع في نابير، سواء جاؤوا في رحلة عمل أو سياحة. يمكن من هنا للضيوف الاستمتاع بسهولة الوصول إلى كل ما تقدمه هذه المدينة النابضة بالحياة. يضفي محيط الفندق اللطيف وقربه من نجا تونجا مواي, Opossum World, ‪Marine Parade‬ سحراً خاصاً على هذا الفندق. يعمل Shoreline Motel على ضمان إقامة مريحة لضيوفه من خلال خدماته الممتازة وحسن ضيافته. يمكن لضيوف الفندق الاستمتاع بالميزات التالية على أرض الفندق: واي فاي مجاني في جميع الغرف, مرافق مخصصة لذوي الاحتياجات الخاصة, تخزين الأمتعة, واي فاي في المناطق العامة, صف السيارات . استمتع بوسائل الراحة الراقية في الغرف أثناء إقامتك هنا. بعض الغرف تتضمن تلفزيون بشاشة مسطحة, اتصال لاسلكي بالإنترنت, حوض الاسترخاء, غرف لغير المدخنين, مكيف هواء لمساعدتك على استعادة طاقتك بعد يوم طويل. سواء كنت من محبي الرياضة أو كنت تتطلع لتفريغ عناء نهار صعب، ستجد خدمات ذات مستوى عالي بانتظارك كمثل سبا. إن Shoreline Motel هو خيار ذكي بالنسبة للمسافرين إلى نابير، بما يوفره من إقامة هادئة ومرحة. يغلق مكتب الاستقبال الخاص بالعقار في تمام الساعة 09:00 مساءً. يجب على النزلاء الذين سيصلون خارج هذه المواعيد التواصل مع العقار مباشرةً قبل وصولهم. معلومات الاتصال موجودة في تأكيد الحجز. The hotel is easy to locate along the beachfront. Check in was easy and hassle-free, the room that we booked is just across the beach, easily accessed by a double glass door. The room itself is in a really good condition, with a king size bed next to the lounge and terrace and a separate 2 bed room for kids. Wifi is pretty fast. Thank you for the review. We are glad that you enjoyed the stay with us. We appreciate your time and hope to host you again. Thank you Karen. Not just for the review but for the support over years and believing that we could provide a great stay to you. We are glad that you enjoyed the stay with us. We appreciate your time and hope to provide you the best experience. A good room with spa bath, daily newspaper, tv etc etc. A downstairs unit, no sea view but had our vehicle parked beside the unit Units getting in need of some new paint, but still very clean and comfortable. Thank you for the review and feedback. We regret that your stay was impacted. We do have plans to renovate the rooms and will be starting with it soon. We appreciate you time and hope to host you again with a better experience. Thank you for the review. We work hard to ensure your comfortable stay. We appreciate your time and business. 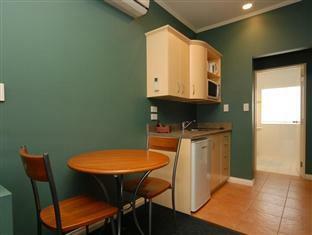 The best value for money of any motel have stayed at in New Zealand. Chose a unit without a view since it was cheaper and only staying one night. Were amazed at size and amenities. Large separate lounge with a single bed to the side, kitchenette with microwave and hot plates, separate bathroom with shower, large separate double bedroom with big circular spa. On the waterfront, round 10 minute stroll to city centre, plenty of cafes handy and very obliging staff - manager only too happy to print out forms and email, give directions etc. We were sorry we weren't staying longer. 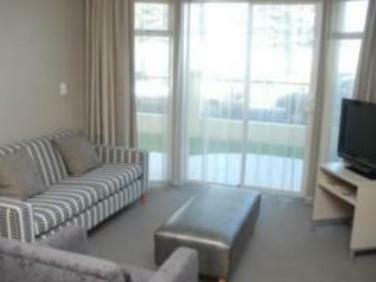 Being on the shore line with a spectacular sun rise view, location in Napier city and good, secure parking. Pros: Great location being in front of the shoreline and being able to have the sun rise and beach just outside the window. Location with in the city is good and accessible to anywhere. Parking is good also, secure and adequate for all the guests to park their vehicles. Room get's cleaned when you're out even though you don't ask for it, but not a big deal. Cons: Low quality heating system, could have done better with a proper air-conditioning system one with a remote etc. like other hotels/motels I've stayed at, also the price we paid for especially during this time of the season (June/winter) was a bit much, I think what we are really paying for here is the view and also the jacuzzi next to the bed? Also, the blanket we got was hardly a blanket for an adult to use, was a bit short and had our feet sticking out and I'm only 5'10. Other than that, very smooth process in checking in and out. Had the pleasure of speaking to the manager him self who told me more about the place and things about the city. He was very helpful and kind enough to open up the reception for us to check out earlier than the said time. Motel was very clean upon entry to the room just as it should be. all the room are east facing, very good sunshine in the morning, good balcony and large spa pool inside the room. the bed is large and comfortable, the room is well-equipped, kitchenwares, dvd player and bathroom stuffs. the hotel location is on the main road, very handy, near to supermarkets, cinema and restaurants. overall speaking, it is awesome!!! We just stayed overnight the hotel is in great location just a short distance walked to restaurants and ocean aquarium. BUT the “INDIAN LADY RECEPTIONIST“ no name plate so i didnt know her name was not accommodating. Thank you for the review and feedback. We are glad that you liked our facilities and town. We regret your experience with our staff. We have checked the same with our staff. Our staff had informed our check-in policy of 2 PM to you clearly. However, she still managed to accommodate your 'Early Check-in' at 1.30 PM. We try our best to accommodate guests requests for without charges wherever possible. However, it might not be in anyone's scope to fulfill all requests. We also have paid early check-in by prior arrangement, which was also not made i this scenario. We once again regret your experience. We appreciate your time and business. I would recommend this motel to anyone. I would stay here again also. This motel is located on the waterfront within walking distance to town and restaurants. We were also able to walk to the bike hire shop to hire bikes to ride along the waterfront. The room was spacious and extrememely well equipped with everything we needed. We stayed 3 nights and all supplies and towels were replenished daily. There were plenty of teas, coffees, soaps, etc. the microwave and stovetop were very useful. The bed was big, however the pillows were like rocks. They definitely need replacing. The air conditioning was efficient. The room was very cosy as we were there in the winter. There were bath robes for us to use and plenty of wardrobe and drawer space for a longer stay. The staff were very friendly and the check in and out was speedy and friendly. The wall paint colour was a dark green which made it look a bit dark, but there were so many lighting options it was not a real issue. Thank you Sue, for the review, feedback and rating. We work hard to ensure a comfortable stay for you. We are working on new colour schemes for the rooms. We appreciate your time and hope to host you again. Great location, lovely outlook and very roomy. Met up with friends from another city for a get together, asked for adjoining rooms, which was no problem. Easy walking distance to town and eateries. Would stay again. Thank you for the review! We are glad that you enjoyed your stay with us. Hope to host you again. We appreciate your time. Very clean and tidy hotel with everything you need and in a fantastic location. We enjoyed the view from our balcony (ocean front studio) and spa bath in the room. All the hotel needed was a lift and swimming pool. Thank you for the review! We are glad that you enjoyed your stay with us. We regret that we were unable to complete your experience due to the lack of lift and swimming pool. Hope to host you again. We appreciate your time. Thank you for the review. We apologise that your experience was impacted by our guests. We are glad that you enjoyed our facilities. We appreciate you time and business. We stayed one night though would have been happy to stay in this motel longer. Our room was big, no sea view - we were at the back. 10 min stroll along sea front into centre. Nearest restaurant Drift about 300m - it was very good by the way. Thank you for the review! We are glad that you enjoyed your stay with us and would be happy to offer you the experience as well as view from one of our Ocean Facing Studios. Hope to host you again. We appreciate your time. Our first floor room was massive with a clear view of the parade and sea, and a large spa. The room was clean and bed was comfortable, and serviced daily. Bathroom was fine and small kitchen area came with provisions plus complimentary tea and coffee. Friendly staff. Short slow 10 minute walk to Tennyson street (centre) however plenty of eateries closer by. We had a nice spacious room overlooking the trout river which provided a lovely relaxing environment. Spa bath/pool outside was great. Staff were friendly and helpful - we will be back for a longer stay with so much fun to be had. We got a room on the high floor, which was good except that there weren't any lifts! Consider this when requesting for a room on a high floor. Our room faced the sea so we had a beautiful view. It was quiet, no disturbances from the street below or from the other neighboring units (at the time of our stay the hotel was in full occupancy). 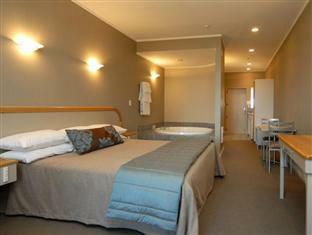 The room was very clean, everything was nicely prepared, the cleanest hotel we've stayed in in NZ! Our room had the jacuzzi, which was in the bedroom (no walls) so we can watch the sea while soaking in it. One observation, reception doesn't have a toilet for the guests, you have to use their office toilet, so bear that in mind. I didn't know how important that was until I had the need for it. :P And they don't have their own restaurant so you have to go out of the complex and find one, which isn't really hard because there are a lot of dining options that are nearby. Mostly we were happy with the condition and service of the motel. 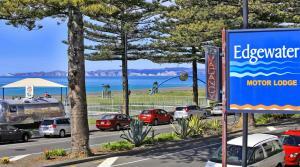 Location is very close to the beach and the iconic Rotary and Pathway of Napier city. I wish we could have enjoyed more of sunshine because it was raining all day and night the time we got there. Such a beautiful motel (felt more like a hotel! ), wonderful staff and brilliant location. The coin operated laundry was such a bonus for long time road warriors. Will be back whenever we visit Napier again. 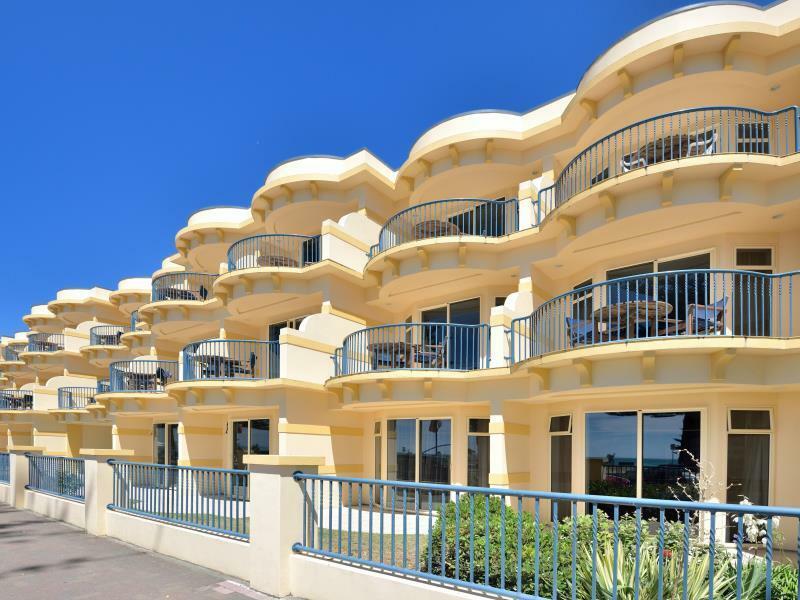 We loved the position of the hotel: opposite the beach & within easy walk of the main town centre & less than 5 mins walk to the aquarium. It was great to sea the sunrise from the sea from our balcony. The manager was helpful & very pleasant. We had all amenities & a big king size bed which was very comfy. I would certainly recommend this motel & would stay here again on a return trip. My partner and I had a beautiful spacious and clean room with a huge spa bath next to the bedroom which was lovely. The location is fantastic and the hotel staff went out of their way to make us feel comfortable.